More fun than Six Sigma! The new Service Management framework that is sweeping the IT industry is Real ITSM. By aligning closely with the way real IT shops run the business today, Real ITSM minimises the cost and impact of change when you adopt this new framework. This is the only authorised Real ITSM body of knowledge, protected by TradeMark, Copyright and the very ugly DespoITSM Program. If you want Real IT Service Management you are going to have to buy the book. Submitted by FGD on Mon, 2008-08-18 07:51. Did Lou and Stan get adequate training in kneecapping? This is a much needed skill to have in their particular service management area. And it ensures a high level of security for the client, especially if they have the proper social skills that go along (Bullying and Intimidation 101 is only two days training, plus half a day for the certification exam at out company). Submitted by skeptic on Mon, 2008-08-18 08:35. Lou and Stan have a defined documented repeatable process for knee-capping, with clearly assigned roles and tightly controlled tools (proscribed actually). Some of their international subsidiaries have local variants, but all certified to the relevant national standards. Submitted by rskolnik on Mon, 2008-08-18 07:13. Will there be a sample chapter (or something like that) available so that we can check before buying? Submitted by skeptic on Mon, 2008-08-18 08:41. Hi Radovan. Good question. Yes there is a fifteen-page sample on Lulu. In addition, you can find numerous extracts on the Real ITSM site, especially starting here. Submitted by rskolnik on Mon, 2008-08-18 12:13. Now I am lost. Is this supposed to be a parody or description of how it's usually done meant to be (an indirect) guide on how not to do it? Submitted by skeptic on Mon, 2008-08-18 20:22. Yup. 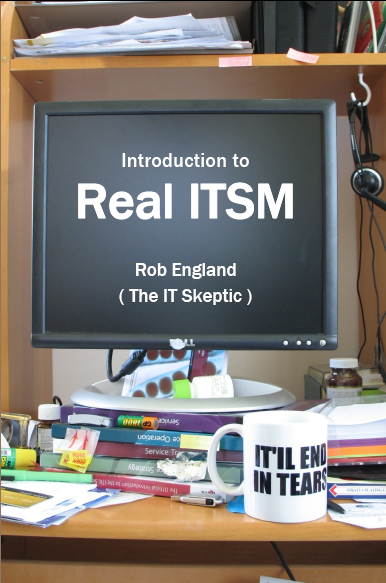 For those with English as a second language, Real ITSM is a spoof. A joke. It pokes fun at existing deficiencies. It can be regarded as an assemblage of current Worst Practice :-D Along the way it also has a pretty hefty dig at ITIL too, trying to pop the hype bubble.